A plan outlined in a canteen made it’s way to more than 30 countries. Self-made billionaires always look for opportunities to move ahead in their life. And so did Shiv Nadar. Started his career at Walchand Group’s Cooper Engineering, Pune in 1967, moved to Delhi in the same year to join Delhi Cloth Mills. During lunch hours, planned to start their own business along with his aspiring colleagues. Today he owns a successful billion dollar business. Looking at the hardware opportunity in India, thought of manufacturing their own. But the problem was the fund for their start-up. Started selling teledigital calculators under their first enterprise named ‘Microcomp’, in order to gather capital for their main venture Hindustan Computers Limited, HCL. Soon HCL was formed with the investment of Rs 1,87,000 in 1976. Grabbing other opportunities, they expanded to HCL Technologies, HCL Infosystems, HCL Healthcare and HCL Talentcare. Shiv Nadar is often known as ‘Magus’ (Old Persian for ‘wizard’) for his efforts on developing educational system. Success in business has made Nadar an extraordinary philanthropist. Shiv Nadar Foundation is working to improve lives of people by through education. Timely identifying new opportunities to work on, is not everyone’s cup of tea. 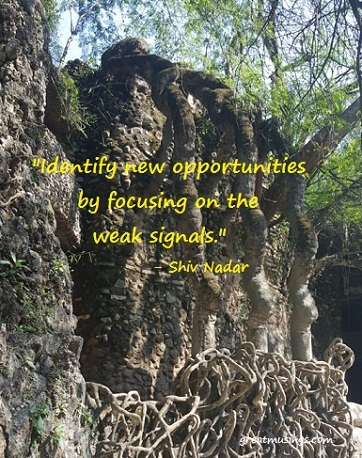 Weak signals of the opportunity often missed by many if recognized and leveraged, may lead to big success.